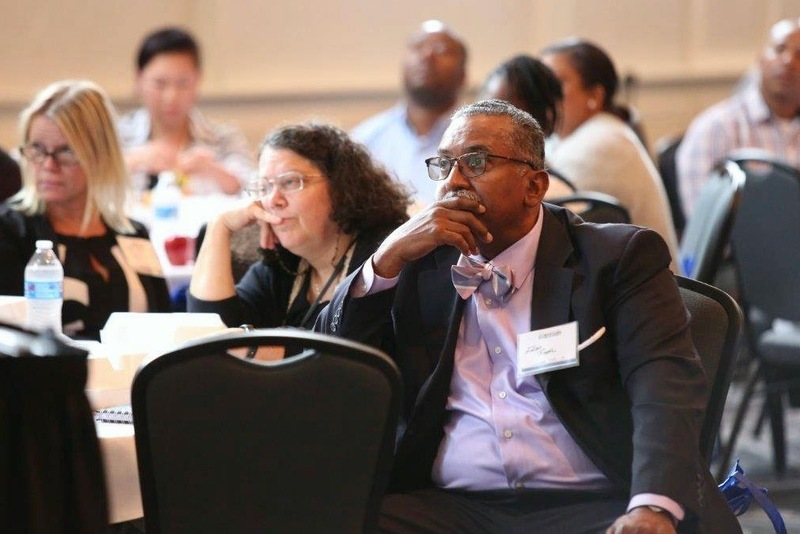 Fred Royal, the president of the Milwaukee NAACP chapter, listens to a speaker at the Social Development Commission’s Summit on Poverty event (Photo by Dennis McMurray, courtesy of SDC). 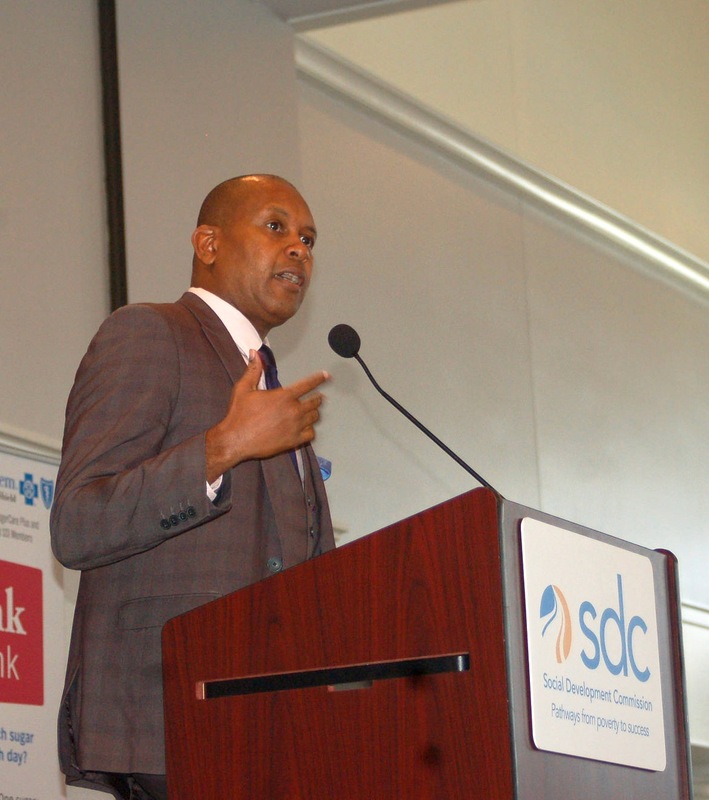 Kevin Powell grew up in a family that for generations had struggled in poverty, but it didn’t have to be that way. In the early 1900s, Powell’s great-grandparents came into possession of 400 acres of land in South Carolina. Things were looking up for a family with five children who previously lived out of a tool shack and sometimes only had syrup to eat. But the family couldn’t hold on to that land for long. White locals tried pressuring Powell’s great-grandfather, who was black, into handing the land over, until one day he died under suspicious circumstances and all but three acres of land were taken from them. The Powells plunged back into poverty and it took decades for any of them to escape it again. Powell, a well-known activist and author who grew up in Jersey City, N.J., in the ‘70s and ‘80s in “horrific” poverty, relayed this story last week during the Social Development Commission’s Summit on Poverty, which aims to change the way poor people are seen and understood in the United States. About 500 people — mostly local nonprofit and public employees — attended the two-day event, which featured Powell and author Kathryn Edin as keynote speakers. One of the most consistent messages that Powell, Edin and other speakers tried to get across is simply that people do not get stuck in poverty because they are lazy or immoral. Often they are tossed or born into it, and there are no easy paths out. “We cannot have an honest conversation about poverty in America if we’re not going to explore how people have been intentionally impoverished,” Powell said. Although there are many different policies, systems and societal phenomena that help keep people in poverty, a huge target of blame during the summit rested squarely on welfare reform in the 1990s. Edin, who is also the Bloomberg Distinguished Professor of Sociology and Public Health at Johns Hopkins University, chronicled the demise of welfare and how it contributes to a growing low-income class. In 1994, the Aid to Families with Dependent Children (AFDC) program served 14.2 million people, about 68 percent of poor families. President Bill Clinton replaced that in 1997 with the Temporary Assistance for Needy Families (TANF) program, which, in 2015, served 750,000 people, about 24 percent of poor families, according to Edin. Edin said welfare reform is one reason why there has been a rise in poor families who live on $2 a day per person, a measure of poverty more commonly reserved for developing nations. In 1992, there were 600,000 people in the U.S. surviving on that kind of cash. Today, there are 1.2 million families, she said. Welfare reform also gave states the chance to “innovate,” and divert federal welfare funds toward other things. Today, Edin said, three-quarters of that money is diverted and only four states — California, Oregon, Minnesota and New York — have a “shell of a cash system left.” In Michigan, for example, a lot of welfare money is instead used to fund scholarships that typically go to children of the middle class. “This is like giving crack to governors and state legislators,” Edin said. A 10 percent decline in welfare coverage is associated with a 2.2 percent increase in food insecurity among single mothers, according to Edin. And a reduction of 100 recipients is associated with an increase of 14 homeless students. In some areas of the country, such as the Mississippi Delta, even those who are receiving welfare live on $2 a day, since the benefits are so measly. “When Bill Clinton, the president, signed that welfare reform bill in 1996 that was a death knell for a lot of folks,” said Powell. He described his mother, who finished school after the eighth grade, as his only support system growing up. He eventually went on to earn a scholarship to attend Rutgers University. Poverty can force people to share housing and accept dangerous jobs, which create more problems that can snowball and make their situations worse. Without a more robust safety net for the poor, Edin said, families face a steep climb out of poverty. She related a story of a low-income, single mother in Cleveland who shared a house and car with others. She won “employee of the month” multiple times at the Wal-Mart where she worked. But one morning, she woke and found the car without any gas, thanks to her roommates. She had no other way of getting to work and was fired immediately. The experts on poverty failed to point out that since welfare reform the number of Americans somehow surviving on ZERO income (no cash) rose from 684,000 in 1994 to 10.2 million Americans with zero income in 2015. For those mostly moms and kids, the people living on $2 a day are enviable. the number of zero income Americans are found each year in SNAP statistics.